I was leaving work Monday night, I crossed the street, and look who I ran into! 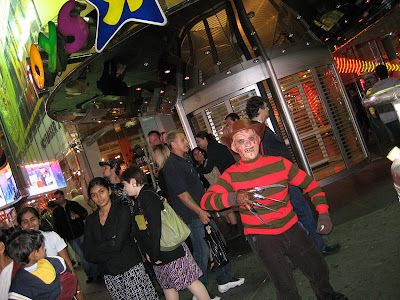 Yup, notorious child murderer & Zoom exile Freddy Krueger has taken up residency in Times Square, one block south of the Naked Cowboy. And, whoa, check it out! He's positioned himself right square in front of the entrance to the largest toy store in America! Now, that's what I call good old German efficiency, Mr. Krueger! That's using the ol' noggin-- let the kids come to YOU for a change! The photo only cost me a buck (if you look closely, you can see it in his left hand), but once I was on the subway, it occurred to me that I most certainly could have slipped him my address wrapped in a twenty, and he would have silenced those motherfucking hard-boiled Polish rat children who bat their whiffle ball against my window on the weekends. THIS is why you should always-- ALWAYS!-- carry a small camera in your bag, folks. Well, last time I saw Robert England he was walking out of a store with 2 people and a dog in Liguna Beach. 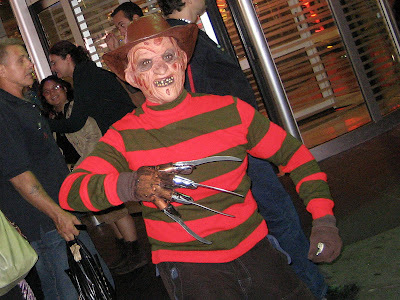 But its nice that Mr. Krueger is spreading the carnage around. Why should California have all the child murdering psycos with mystical occult powers? Good for you New York! To be sure, it was more likely Roberto Escalante than Robert England-- he had a pretty thick Spanish accent.